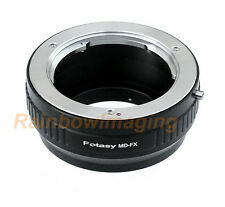 Minolta MC Rokkor-X 50mm f/1.4 PG Lens Made In Japan - Excellent Condition! Minolta MD Rokkor-X 135mm f/1.4 1:28 PG Lens & Case. Shipped with USPS Priority Mail. Dating back to 1973, the Minolta MC Rokkor-X 50-millimeter f/1.4 PG lens provides smooth focusing and works especially well for portrait shots. You can use it to photograph subjects as close as 1.75 feet away. The f-stops run from a maximum of 1.4 down to 16. It can also handle 55-millimeter diameter filters and has a length of 46-millimeters. The maximum magnification is 1:6.6, and the lens weighs 11 oz. A rubber grip with a waffle pattern provides easy manipulation, while precision helicoids give you a sharp image.This Minolta MC Rokkor 50-millimeter f/1.4 version has multi-coated elements in six groups. At full extension, it comes out nearly 1.8 inches out from the flange. Accordingly, the diameter is 2.5 inches around. Full click stops are at f/1.4 and f/2, whereas half click stops are from f/2 through f/16. The lens uses a 55-millimeter filter thread, and it has six aperture blades. Users will also like the premium focus capabilities that allow them to easily take shots of subjects that are half a meter away. Regarding durability, the entire frame is made of solid metal, which provides protection from moisture and rust.One of the significant reasons for the long-term popularity of Minolta MC Rokkor-PG 50-millimeter f/1.4 lens is the excellent performance. Not only it has very little barrel distortion, but it is extremely sharp at all apertures. The sharpness helps take care of the veiling, which is often caused by residual spherical aberration in a lens. Under normal circumstances, you don't need to run for Photoshop or other image-enhancing software as the lens offers a neutral color balance at standard configuration. Focusing with this product is a dream for any photographer because the smooth focus helicoids will respond to commands with only one fingertip. As such, the waffle pattern provides a perfect grip on different cameras for focusing on difficult-to-manage subjects.There is no doubt that Minolta is very proud of the Rokkor X 50-millimeter f/1.4 PG lenses because they are known as one of the sharpest standard primes in the SR family. When using these lenses the first time, you will easily come to grips with a very smooth orientation because it integrates and balances easily on a camera. The optical qualities of the product make it a perfect hardware for portrait photos. As it is a manual focus version, photographers will need to adjust settings for optimal results. Users can select a variety of controls to handle haziness around corners.It should be noted that the Minolta MC Rokkor X 50-millimeter f/1.4 PG lens underwent slight modifications during its production years between 1973 and 1977. Accordingly, users may only notice minor cosmetic changes in the model because mechanical features and optics quality remained unchanged throughout the production cycle. The earliest production lenses were called ROKKOR with a painted red dot on the lens control. Later, the production also continued under ROKKOR-X lenses brand in orange. The replacement changed the red dot to a red plastic bead on the index. Despite relatively minor cosmetic changes for marketing and copyright purposes, both 50-millimeter size lenses are similar in mechanical features and quality. I purchased it mount it to a canon DSLR and it might be the converter I bought but the image is not the sharpest. I don't blame that on the lens though because the lens visually is "on point" and very clean. I feel that the converter is giving me the bad results but I'm not planning to buy another converter to find out. Note* I am talking about wide open because what is the point of getting a lens with a wide aperture if you just going to stop it down. When stopped down the lens performed as expected for the most part. Long story short keep it on a Minolta film camera and you won't be disappointed. For the money you can't find a better fast lens! Lets face it, you purchase a 1.4/50 for using it wide open. And wide open this lens gives a pleasing result. Sharp enough, but not tack sharp. To its benefit, it has great bokeh, so your out of focus parts of which there will be lots are pleasant, and not harsh or busy. Stop it down to F8 and you will be rewarded with an extremely sharp lens, well controlled and high contrast. The newer versions are more expensive, sharper and lighter. The older are not as sharp, cheaper and heavier. Often the iris blades get gummed up or there becomes a light haze in the glass that needs to be cleaned up. but they are rugged, and well built and will last for a very long time. Best wide open fast 50 in the manual focus market, pro results at low cost. I had few 50mm lenses With a Maximum aperture of 1.4. Minolta MD lenses are also very Sharp wide open, and affordable these days. No Wonder Leitz had Minolta to make some lnses for them... It is not much to say about this lens, fast, very very Sharp, and all metal Construction, will last longer than newer plastic optics. Highly recommended. I can also add that adjusting infinity focus is very easy on those MD Minolta lenses, if it should be an issue. It can also be used on many digitals With cheap adapter, DSLR and Micro Four Thirds.